Located along the Trillium Gap Trail, Grotto Falls is one of the most unique waterfalls in the Smokies. Hikers will have the chance to walk behind this 25-foot high waterfall, where they will feel a refreshing mist and maybe even spy some salamanders lounging around. The hike to Grotto Falls is also notable for its special furry visitors. On most Monday, Wednesday, and Friday mornings, a herd of llamas passes by Grotto Falls as they deliver supplies to the top of Mount LeConte. If you can plan your hike accordingly, the llamas are quite a sight to behold! The hike to Grotto Falls is 2.6 miles round trip and is considered moderate in difficulty. The trailhead is located off of the Roaring Fork Motor Nature Trail. The Laurel Falls Trail is another one of the best waterfall hikes in the Smoky Mountains and is extremely popular on weekends and during the summer months. This 80-foot tall waterfall is named after the mountain laurel, a type of shrub that you can see along the trail. The Laurel Falls Trail is paved, but the pavement is uneven and can be slippery when wet, so children should be closely supervised at all times during this hike. The Laurel Falls Trail is 2.6 miles round trip and is considered moderate in difficulty. The trailhead is located off of Little River Road. Rainbow Falls is another stunning 80-foot high waterfall in the national park. The waterfall takes its name from the rainbow mist it produces on sunny afternoons. Hikers can expect a noticeable gain in elevation of about 1,500’ as they make their way through the trail. The rocks around the waterfall are very slippery so climbing them is strictly prohibited. The Rainbow Falls Trail is 5.4 miles round trip and is generally considered moderate in difficulty, although some hikers would deem it challenging due to its rocky terrain and the sharp gain in elevation. The trailhead is located off of Historic Nature Trail. At 100 feet high, Ramsey Cascades is the tallest waterfall in the Great Smoky Mountains National Park! Visitors will love watching the water drop from towering rock outcroppings into a small pool that frequently attracts salamanders. Along the trail to the waterfall, hikers will enjoy views of a river and old-growth hardwood forest. Climbing to the top of the falls is very dangerous and strictly prohibited. The Ramsey Cascades Trail is 8 miles round trip and is considered strenuous, as it gains over 2,000’ in elevation over the course of the hike. The trailhead is located near the Greenbrier entrance to the national park. Abrams Falls may not be particularly tall, but it is truly magnificent to see in person. This 20-foot high waterfall has a large volume of rushing water and features a beautiful pool at its base. Abrams Falls and Abrams Creek are both named after a Cherokee chief who once led a nearby village. Swimming is not allowed in the pool at the base of the falls. The Abrams Falls Trail is 5 miles round trip and is generally considered moderate in difficulty, although some hikers may deem it challenging. The trailhead is located after stop #10 on the Cades Cove Loop Road. 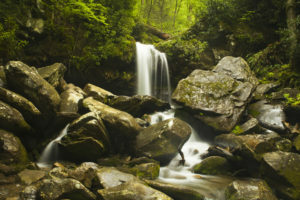 When you stay with Aunt Bug’s Cabin Rentals, you will be near all of the best waterfall hikes in the Smoky Mountains. Our cabins come with your choice of wonderful amenities, including hot tubs, mountain views, riverside views, theater rooms, game rooms, outdoor fire pits, and swimming pool access. With everything from 1 bedroom cabins to 8 bedroom cabins, we are sure to have the ideal accommodations for your getaway. To start planning your vacation, browse our selection of Smoky Mountain cabin rentals!